Thanks to a post in another thread I discovered I had overlooked a BSA Parts Service Bulletin with information applicable to my Spitfire. I scanned that Bulletin and added it to an appropriate page early in this thread. Unfortunately, this means I'll now have to carefully go through all those Bulletins, BSA Service Sheets, and Hap Alzina literature to see if I overlooked anything else. To finish with the DocZ saga, I modified the existing battery clamps by adding segments of 1" ID Cu pipe to have much more surface area in contact with the 1" OD brass terminals I attached to the battery. They work great. To complete the rusty stanchion saga, none of my BSF/BSW sockets fit the cap at the bottom end of the stanchion so I measured the distance across the flats to be 1.203", making it an 11/16 BSW. However, my socket of that size was significantly too large. However, I have a deep-drive 1-3/16" (1.188") A/F that substitutes for a proper 11/16" W socket that was a snug fit on the cap. It then took the 200+ ft.lbs. of my battery-powered impact wrench for nearly 5 sec. before the cap moved. But, after that it spun off without problem. 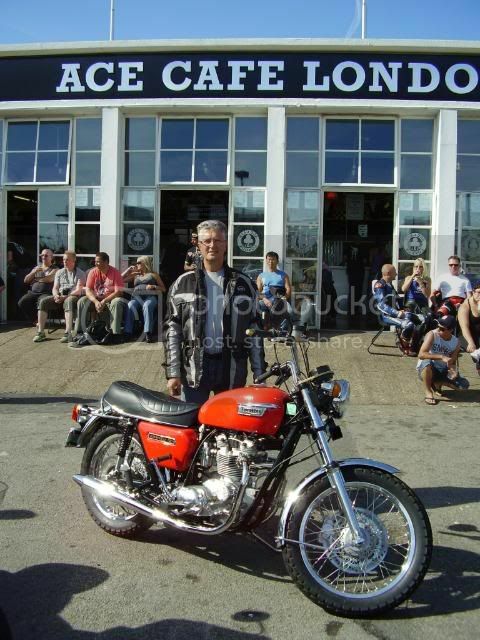 I then took time off from the Spitfire to change the oil and filter on one of my Ducatis and then perform a shell game to reposition the bikes, leaving my Competition Gold Star on the lift. I need to disassemble the forks to replace the clip-ons with a set of flat bars I have to give the rider a more upright position. I'm planning for the Three-Gold-Star ride I'm organizing for later this Spring to spend a fair number of miles on dirt roads in the mountains and clip-ons are far from idea for that. Also, planning for the future -- the far, far future, I hope -- with bars in the "normal" mounting position it will be a relatively easy job to switch to ever-higher bars as dictated by creeping decrepitude. I still need to finish modifying the Sunnen mandrel to reach past the tapered plug at the bottom of the slider but that will require a piece of steel pipe that I haven't started looking for yet. I discovered the thick-wall Al tubing I assumed would work distorted too much in the lateh. I needed to hone a slider to wear in the stones so I could make accurate measurements of what needed to be removed from the mandrel, stone, and wedge to allow it to reach past the tapered plug. Unfortunately, having done so, the image shows my Plan A won't work. Shown in red are the portions of the stone and wedge that would have to be removed. I do have a more complex Plan B (and C) but it will take some time to explore it in detail to see if it can work. Meanwhile, this moves to the back burner. Having recently gained way too much familiarity with the innards of pre-unit forks, I optimistically assumed rebuilding the ones on my Special Competition Gold Star would be simple. So today I took one step forward with them. I'm now at least three steps back although I've only removed and measured one leg so far. The bottom of the stanchion is protected by the bottom bush so it should have the original OD. I did not keep track of the orientation of this stanchion when I removed it, but the ODs measured 90° apart are both 1.2480". This means that, assuming the top bushes were reamed to size by the factory (i.e. 1.2500"), the original clearance would have been 0.0020". 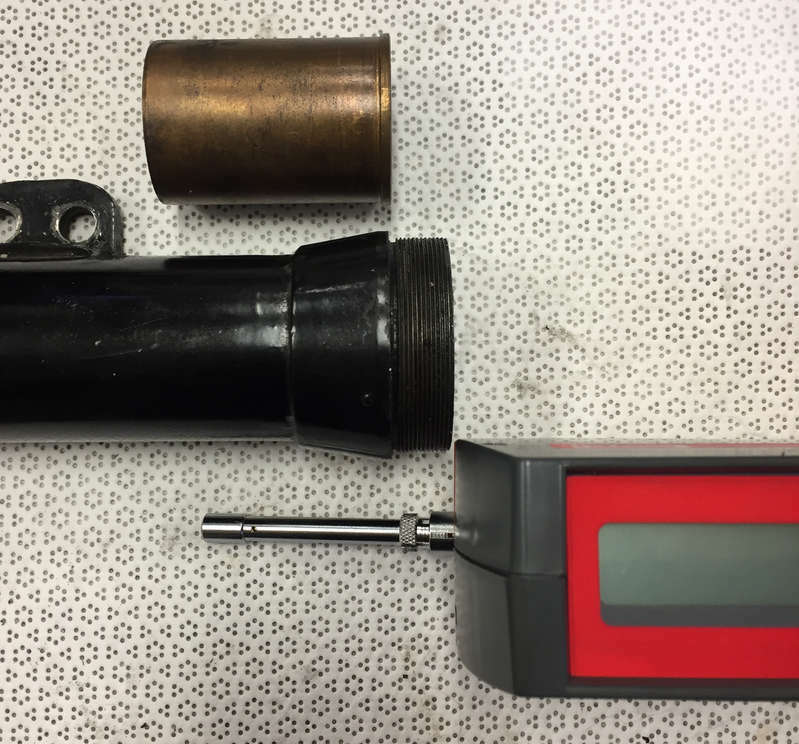 The same measurement made 5" above the bottom of the stanchion found 0.001" wear in one orientation and 0.0002" in the other. I don't have the same OCD desire to rebuild this bike to 100.0% originality as I do the Spitfire, but neither do I relish going down the rabbit hole of aftermarket parts with stanchions and bushes. I just want to get the forks properly rebuilt and the bike set aside to wait for spring so I can turn to other projects. What to do? What to do? Not much wrong there and the potential to make it worse not better with new parts made to the book clearances hence the quandrey. 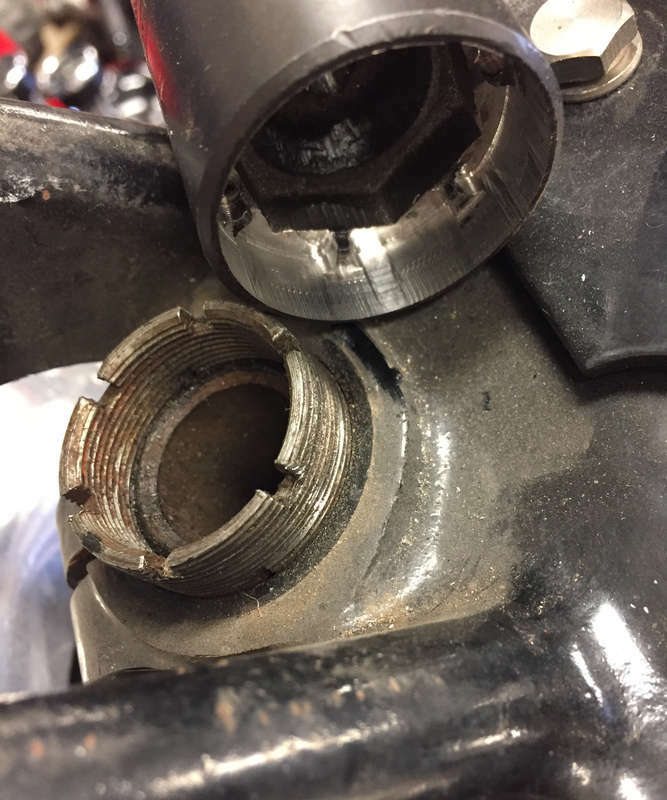 Whatever the reason for the excessive OEM clearance ie ease of assembly or loose fits that allow good fork action, your forks work with the tight clearance you have so why change it. So to remove risk of new parts and increase the likelyhood of improving what you have is the objective. You can get the current stanchions hard chromed back to size and if you pick the right supplier then ovality and straightness should be as good or better. 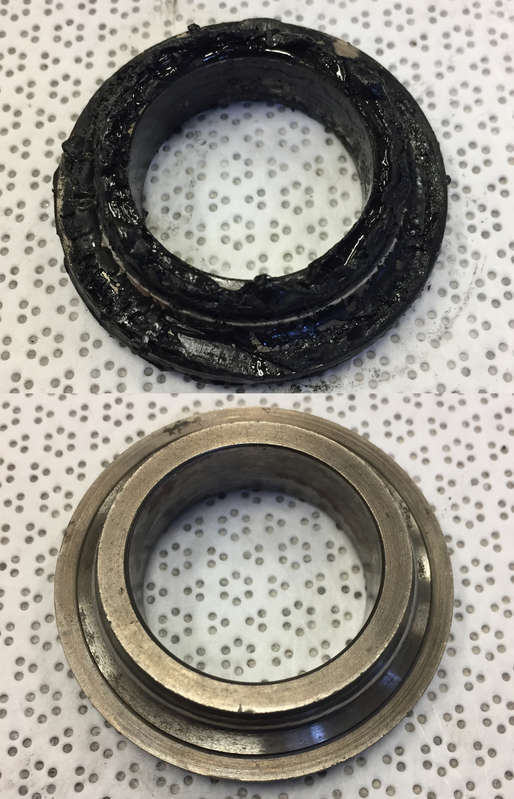 You also gain better conditions for the seal and the top bush, eg lower stiction and higher surface finish than original. Cost will be higher than off the shelf but pick the right supplier and its worth it. New seals, but the bushes may not need changing, the top bushes set the size of the rechomed stanchion so unless out of round size the stanchion to these, lower bush more likely to need to be custom if you use the Sunnen on the fork lower. Last edited by GrandPaul; 02/07/19 2:18 pm. Yep, love my DocZ kit. I finally took the time to properly deal with the inadequate battery clamps mine was equipped with. I now have a pair of 500 A welding clamps on it that provide relatively large areas of Cu, rather than just the contact made by a few sharp teeth, to conduct the ~250 A from the battery terminals that the two motors draw under load. ...lower bush more likely to need to be custom if you use the Sunnen on the fork lower. Thanks very much for your suggestions. I sent a request for quote to one hard chrome company whose web page makes it seem they might deal with small quantities of small parts (compared with massive rollers) and am waiting to hear back from them. Meanwhile, in the interests of exploring all options, I also sent a request to the well-known (in the U.S.) Franks Forks, but they replied they don't make those stanchions. Aftermarket stanchions from a dealer do remain an option (assuming the dealer has a tenth-reading micrometer). Aside from hard chrome or actual replacements, I assume the asymmetric wear I found in the middle occurred primarily in the fore-aft direction. So, if I indexed the stanchion in its current condition when installing it to make the wear direction side-to-side the important fore-aft clearance would vary by a negligible 0.0002" over the entire length. So, as kommando said, it's not as bad as the present clearances indicate at first sight, and nothing that couldn't be corrected to almost as-new condition with a pair of bespoke bushes. If the second slider turns out to be the same as the first I'll be inclined to leave the Sunnen on the shelf, so to speak. The ovality and wear of this first slider is such that if I size the bottom bush to give it the specified min. clearance of 0.001" at the tightest location, the clearance will be less than the max. spec of 0.004" at the widest location. 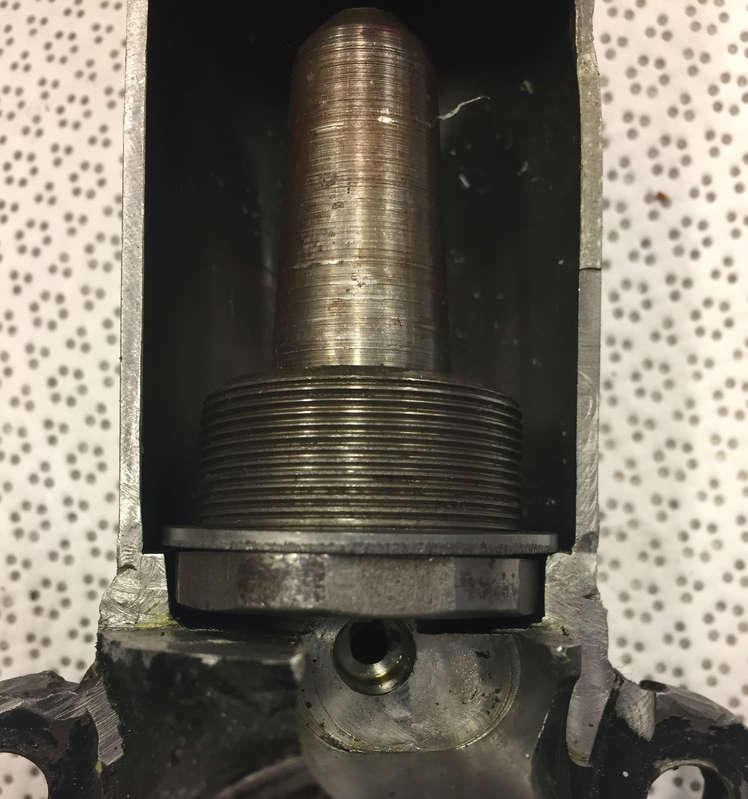 Further, that wide clearance happens when it's near full compression, and over most of the travel the clearance would be less than 0.0025". Again, though, I may have to reconsider once I take the second leg off and examine it. Turning stanchions 90 degrees to change the wear spots never worked for me, fork legs take a set / slight bend usually around the bottom yoke area, if you turn them they stop being parallel . How straight are your stanchions? How straight are your stanchions? I beg your pardon, sir... oh, the fork tubes on my motorcycle. I haven't measured that yet but will tomorrow, along with the straightness of the slider. Today I was abducted for a forced march up a rocky trail through a canyon into the mountains so work on the forks was on pause. I have my stanchion straightening jig in final form, but please be gentle in your criticism of the welds. I repurposed a heavy steel bracket that already had risers with 90-deg. bends welded on both ends, and it stretched my 200 A TIG machine to the limit to weld the 1/2"x2" steel bars to those risers as well as to the length of the steel pipe, although switching to my 50/50 He/Ar bottle definitely helped. The photograph is an "exploded diagram" so the individual pieces of the jig can be seen. Anyway, the feet at the left end are rigidly clamped to the I beams of the 30T press which serves as the reference surface. 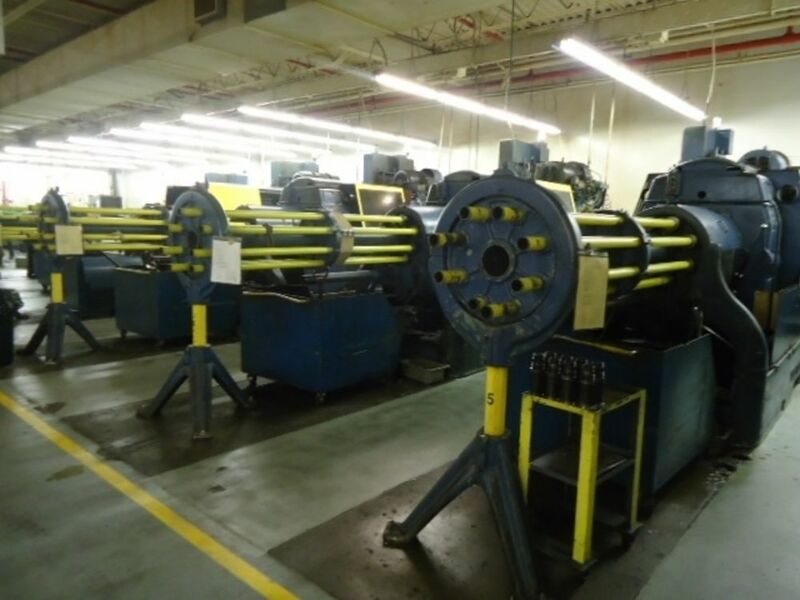 The ~9" section of 2-1/8" ID steel pipe is centered in the press allowing pipes of any length to pass through both sides of the press to be unbent. 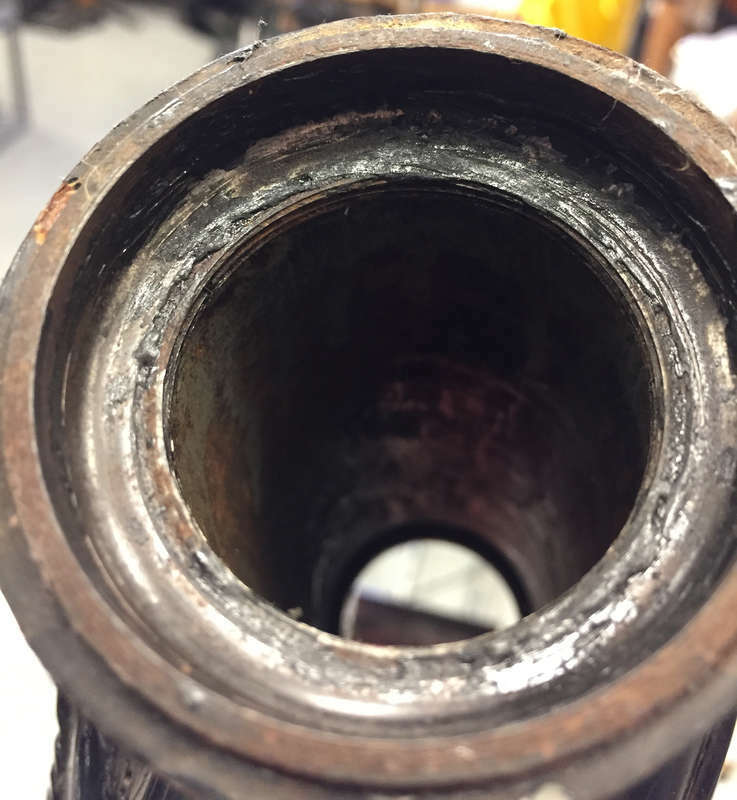 Three 3/8" tapped holes in the steel (not cast iron) pipe are used to clamp a sectioned 1-1/2" ID Al tube against the stanchion to keep that portion straight and unmarred. 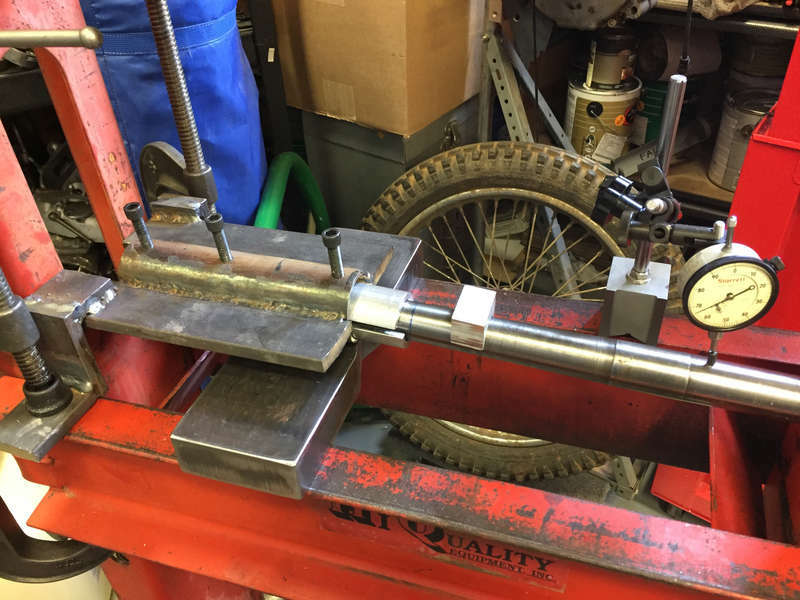 The largest diameter on my Gold Star forks is 1-3/8", but by using tubing with a slightly larger diameter than that it will be possible to insert tubing that is somewhat bent as well. This is one of the ways I tried to design a jig that was as universal as possible. It can't be seen but I cut a gentle taper in the end of the Al tube that I further rounded with a half-round file before sectioning it to avoid a sharp surface pressing against the stanchion. 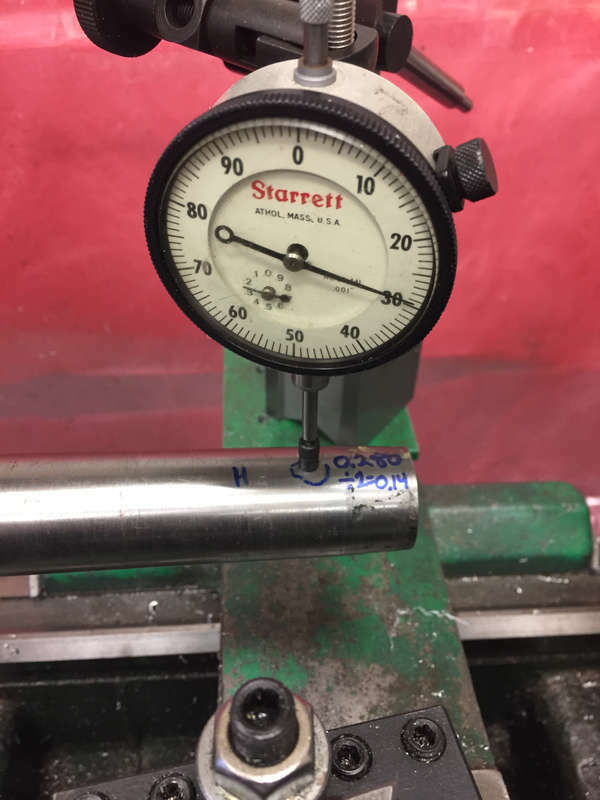 It also can't be seen from this photograph but the bottom of the steel tube presses tightly against the steel block under it so it's impossible for the jig itself to bend even slightly when pressure is applied, which would complicate the dial indicator readings if that happened. 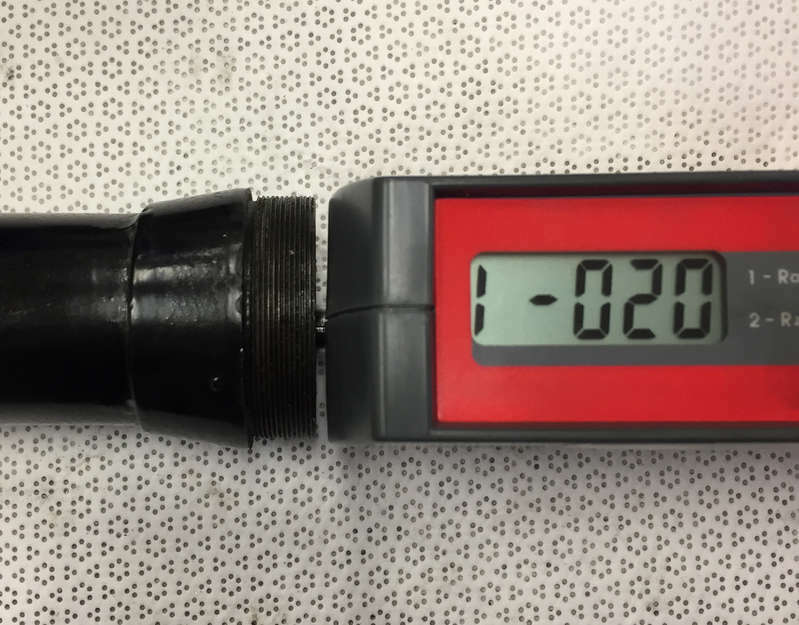 As (over)built, the jig does not deflect with respect to the surface of the press it's mounted to so 0.001" change in reading of the dial indicator is 0.001" change in bend of the stanchion. 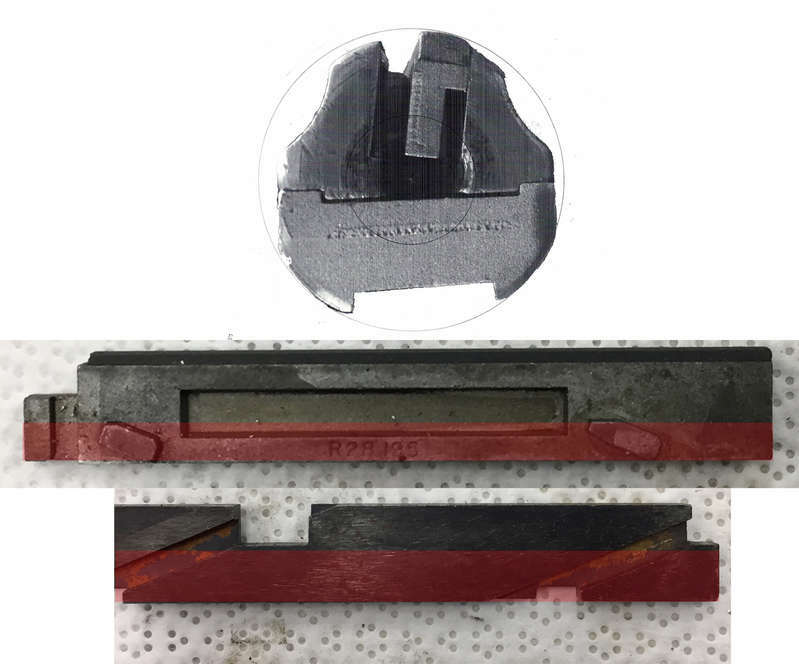 A piece of Al square stock drilled 1-3/8" and then sectioned is what the press presses against, again to avoid marring of the stanchion. Thanks to having 30T at my disposal the press does not need the additional leverage of pushing against the end of the stanchion. This will be very helpful, if not essential, if straightening tubes that are kinked in several places. The principle of operation for a one-kink bend is I put the straight end in the lathe and measure the TIR at the far end, marking the high point. I then clamp the straight end in my jig and adjust a 1"-travel dial indicator to be '0' close to its maximum travel (because pushing down on the stanchion reduces the reading on the indicator). I then sneak up on the bend by successively pressing ever larger deflections, removing the pressure, checking on the indicator how much the bend has decreased, and repeating until it has decreased by 1/2xTIR. In principle this only should take one attempt, but in practice a few trips back and forth between the press and the lathe are required. Although I got some other things done today, I didn't get much accomplished on the Spitfire. The only tangible result is shown in the photograph. The taper at the top of the stanchions makes it impossible to grip with the chuck on the Sunnen. So, to mount them I modified a chewed-up top cap by drilling it in the lathe and silver soldering a short 1/2"-dia. 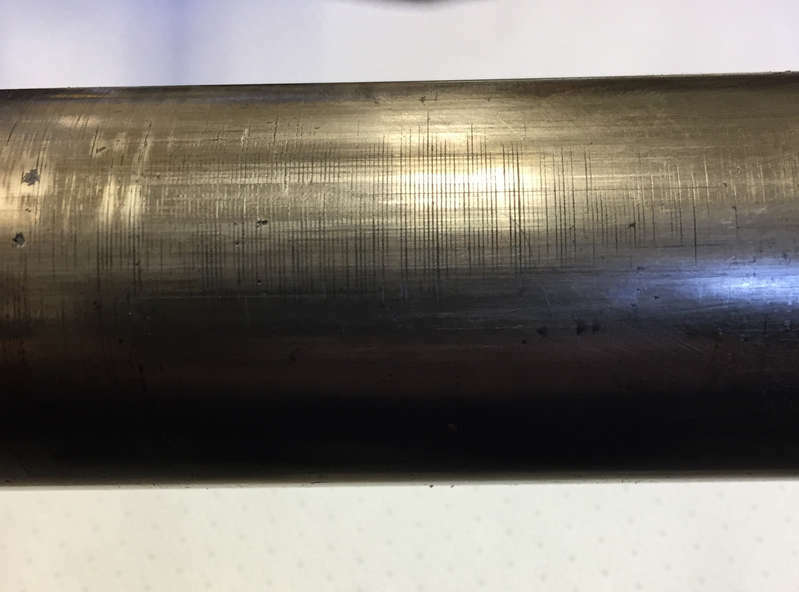 stub of stainless rod. It works well. The only two things I accomplished today[*] were to paint the stanchion bending jig with etching primer, and open a box from McMaster-Carr containing the bronze I'll use to make bushes for the forks. A thinner-walled tube of bronze would have been cheaper but the tolerance on the OD was such that it might have been a few thou. too small and didn't want to take the chance. 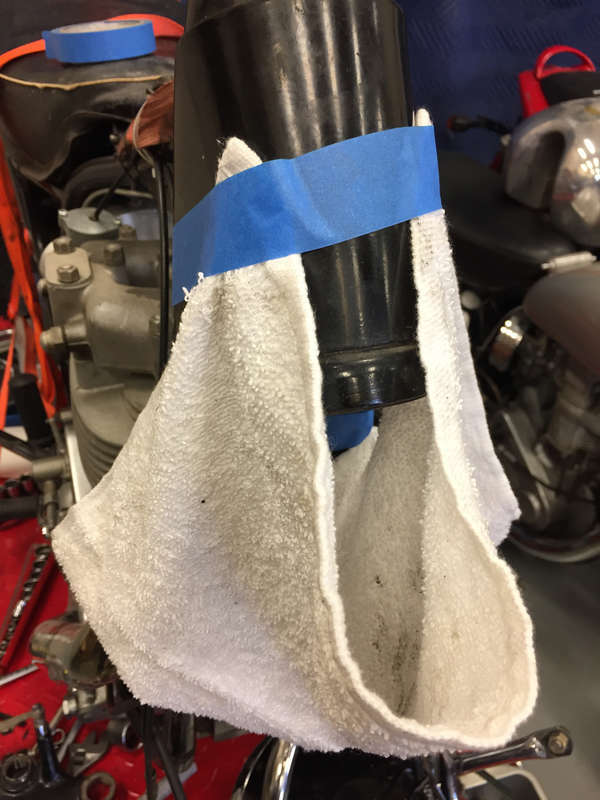 [*] Many years ago when I lived in Illinois I learned the principle from another motorcyclist that even on days when you don't have time to do anything, it's important to do something. The progress on such days may be minor but it adds up. Although the three images in this post are from work on my Competition Gold Star, they're applicable to this Spitfire restoration. I removed the second fork leg today and found something interesting/distressing, as discussed below. Before getting to that, the first photograph shows a socket I made that makes dealing with the weird top nut on the forks easy. The second photograph shows the nut and washer that are at the bottom of stanchions dropped into my cutaway slider. Interestingly, as can be seen, at full travel the washer will make contact with the ID of the slider rather than the nut with the bottom of the slider. The third photograph reveals a lot. Instead of the stanchion being smooth the surface has machining marks in it. The OD of the stanchion is correct so it hasn't been re-machined after leaving the factory, and the grooves are circumferential so they're not due to wear. 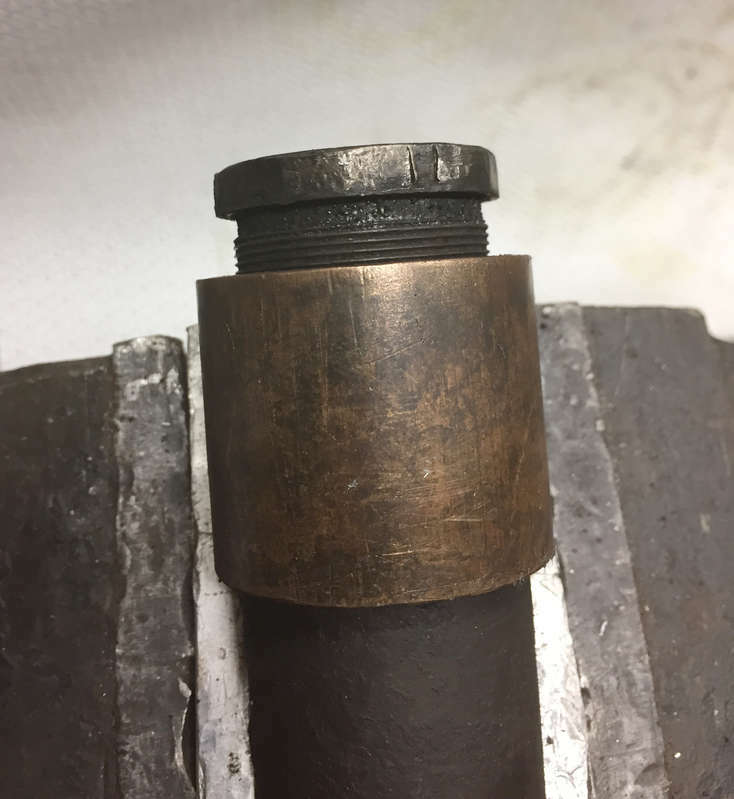 To be accurate, the diameter in the middle region where the grooves are located is worn by ~0.0015". While a smooth region under the bottom bush has a roughness of ~30 µin, these machining marks are a huge ~175 µin. An apprentice machinist must have been in charge the day this one was made. An apprentice machinist must have been in charge the day this one was made. And Quality Control had the day off! 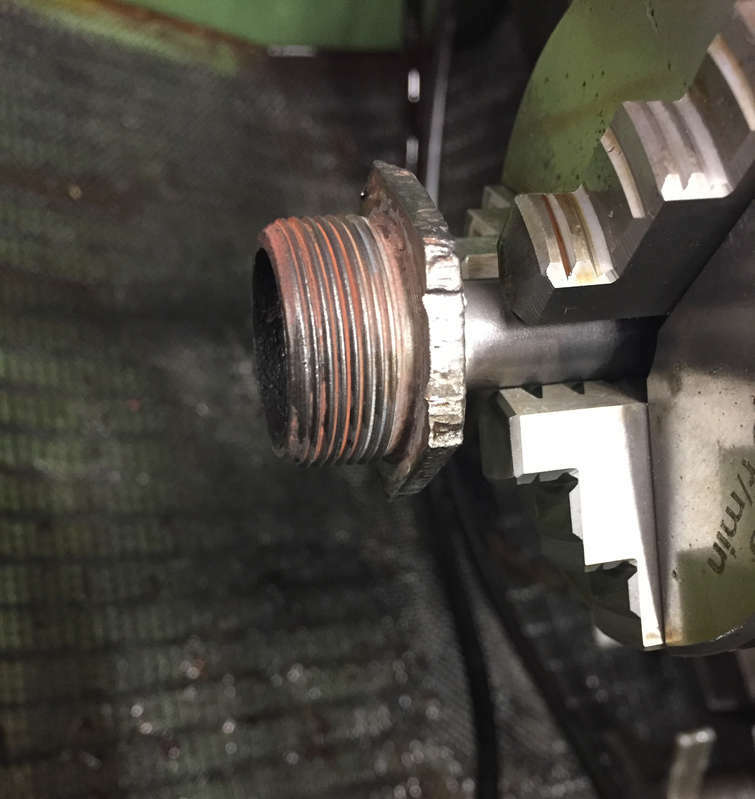 Having worked in Birmingham machine shops in the 80's its more likely the auto machine was running unattended and swarf was jammed into the tool-holder and was being dragged across the workpiece as the tool was returning to its start position. They were set up by a tool setter and then left to run with a labourer feeding the tubes with steel bar/tube and left running. The third photograph reveals a lot. Instead of the stanchion being smooth the surface has machining marks in it. Would be interesting to see what kind of finish the fork sliders have internally, I wouldnt be suprised if some have a similar machining marks. Thanks very much for posting that interesting photograph. So, if an apprentice is at fault it might have been one working in quality control that day. Your wish is my command. The first photograph shows that the probe on my roughness tester isn't long enough to reach more than ~2" into the slider, which isn't past the region that was covered by the top bush. However, because it was protected by the bush this region should have the roughness with which it left the factory. Sighting down the slider with a flashlight doesn't reveal any obvious difference in roughness further down but maybe tomorrow I'll deploy the borescope to see what I can see. Anyway, as can be seen from the second photograph the roughness is ~ 20 µin. which is, ahem, roughly the same as the smooth regions on the stanchions. With the wheel and stanchions off, and the steering damper fully disengaged, the yokes felt like they were turning in tar. In for a penny, in for a Euro, as the Brits say, so I disassembled the yokes to grease the bearings. The top of the second photograph shows what I found. The race is coated with what looks and feels like roofing tar. 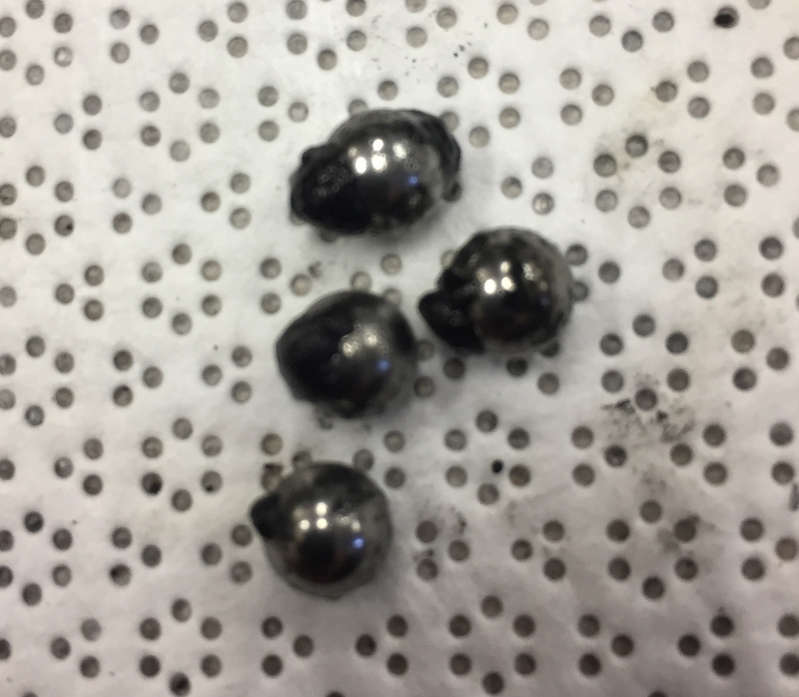 Well, that explains why it felt like it was turning in tar. My records of the rebuild ~25 years ago don't mention what grease I used, but what remains of it today is sticky like roofing tar, making it impossible to scrape off. Acetone didn't do a thing to it, but ten minutes in my bucket of Gunk+diesel, plus another minute or two with a brass brush, completely removed it. I did the same with the tar on the race in the bottom yoke, but the two races in the frame required a little more work because, as indicated by the third photograph, there wasn't any easy way to let them soak in the mixture (I'd already scraped away quite a bit before taking this photograph). I used a paper towel to sort of soak them, alternating with a brass brush and some more of the mixture, and another paper towel to wipe away residue. After less than ten minutes each the races in the frame were as clean as the two that I was able to soak. The balls are more problematic since there are a lot of them (40 total) and they're too small to easily hold to scrub with a brush. I soaked them in the mixture and wiped as much away as I could, but they're spending the night marinating in a witch's brew of MEK + toluene. Note: I should mention that the above describes what I found on my Special Competition Gold Star, not my Spitfire. I'm posting the information here rather than in a new thread since the forks are the same. That color of the grease together with its consistency would indicate to me the use of a grease with molybdenum disulphide in it. I have seen a similar effect ---a thick tar like appearance from use of that type of grease. So, if an apprentice is at fault it might have been one working in quality control that day. In the 80's quality control was not high on the agenda, BS5750 (now the modern ISO9000) had been published in 79 and was being 'Looked at' during my apprenticeship, I very much doubt in the 60's a quality control bod of any description was checking parts at random and plotting dimension as the dept did not exist. An internal inspection dept maybe, more likely an incoming parts inspector as a favour, Quality Control no, at it would not have existed except in Rolls Royce maybe. 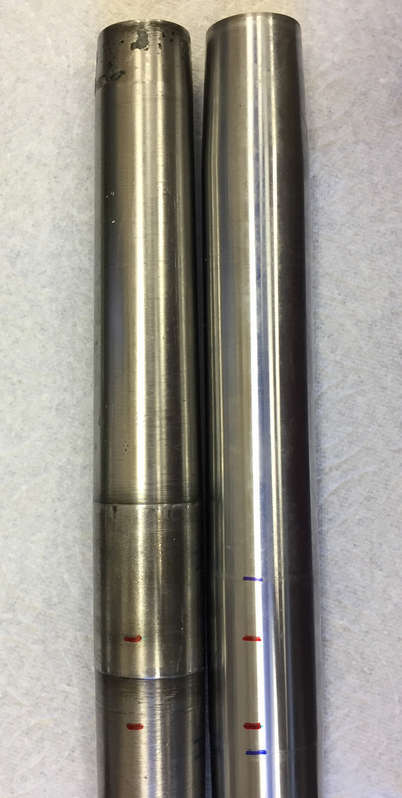 On the ID's of the stanchions OEM are rougher than the current replacements, as I doubt no one bothers with the insides except the threads top and bottom that must be a function of the feedstock not machining by the stanchion maker. The color is grey, not dark brown, so that would make sense. Apparently twenty-five years is long enough for the organic part of the grease to evaporate and/or turn into CO2. As of two years ago my new favorite grease for purposes like this is Mobil 1 Synthetic because it has a drop temperature of 550 °F, which is higher than the minimum of 500 °F that Michael Morse of Vintage Brake recommends for use on wheel bearings of racing bikes. On the subject of replacement stanchions, not self-tied to the yoke of originality on this Gold Star, and wanting to get this maintenance job finished so I can move on to something else, last Sunday I ordered a set of replacement 40-5027 stanchions from MAP. They arrived yesterday, only five working days after I placed the order. I bought them through eBay because the price with free shipping was ~$10 less than the price on their web site where shipping was extra. In case anyone else is interested in replacing their knackered stanchions, the details I measured on these are given next. MAP's description says they're for 1950-61 Golden Flashes but includes part number 42-5027 which is what DBD Clubman Gold Stars use. Although their description clearly states they come only with the top bushes, and that the bottom ones must be ordered separately, the photographs show the stanchions with both bushes. Anyway, although I expected to make those bottom bushes myself, they came with both (although, because of wear of my sliders, I'll end up making a set myself no matter what). The stanchions are beautiful and have ~20 µin. roughness along the length that fits in the sliders. As shown in the first photograph they are 3/4" longer than the ones from my Gold Star. Although the fatter "collar" that is clamped by the lower yoke can't be easily seen on the MAP stanchion in this photograph, it is aligned with the collar on the BSA stanchion when the bottoms of the forks are aligned, which means the extra 3/4" length is above that point. I was worried this extra length would be an issue, but the second photograph -- this time with the tops of the stanchions aligned -- shows the position of the lower yoke in red, with the collar on the MAP stanchion marked in blue to make it more visible. The collars are 2" high on both stanchions whereas the height of the yoke is only 1", allowing room for misalignment. However, as can be seen from the photograph, only half the BSA collar was clamped by the stanchion whereas full contact is made on the MAP. This is a case where an aftermarket part is better than original. The other dimensions on the MAP also seem excellent. For example, the 9¾" length at the bottom end that operates inside the slider is 1/8" longer on the MAP than on the BSA one and the OD of that end is 0.0007" larger. The actual OD isn't critical as long as the ID of the mating bush matches, but having them the same dimension as standard BSA stanchions is convenient for interchangeability. 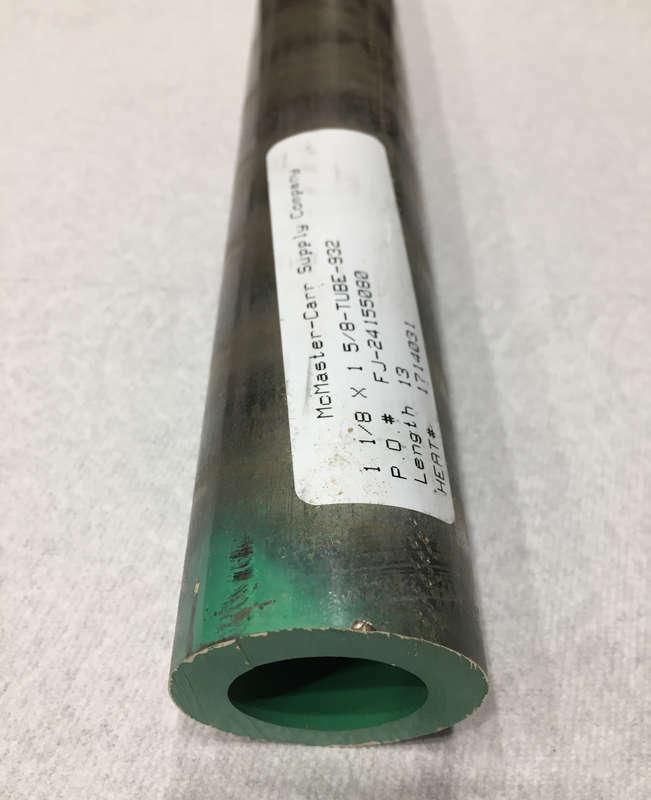 The clearance between the IDs of both upper bushes and the ODs of the stanchions is 0.0025"-0.0030", showing good quality control over both items. The clearances of the bottom bushes with the two sliders varies over the ranges 0.0057"-0.0062" and 0.0078"-0.0094" due to wear of the sliders, not variations in the bushes. If I machine bushes sized to the sliders with 0.001" clearance at the tight ends of these ranges the loose ends will be 0.0015" and 0.0026" respectively, both less than the 0.004" max. specification. What I don't know about these replacements is the Yield strength of the steel used, which determines whether or not they will take on a permanent bend in use like the BSA ones all seem to. I could measure this myself, but it's a destructive test (or, at least, it leaves them with a bend that I'd then have to remove as best as possible) so I'm not going to do that test. The third photograph shows the "diaper" I fitted over the bottom of the frame to catch any balls that dropped from the top race, shown in the fourth photograph, during assembly, but it wasn't necessary. However, it certainly was when I disassembled the yokes since otherwise a quarter of them would have fallen onto the lift and from there to who knows where. 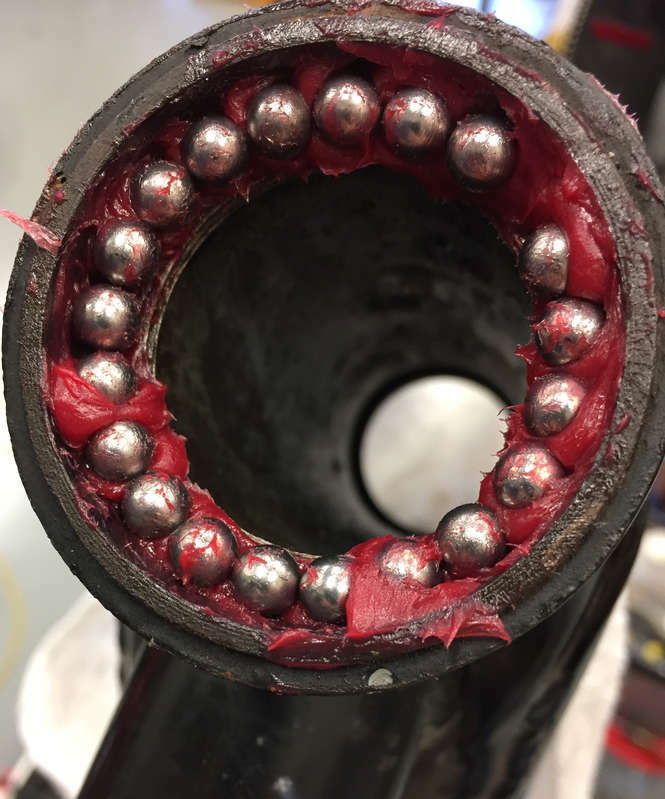 I attached the balls to the race in the bottom yoke with grease in the same way and held a towel under it as I inserted the steering tube into the frame in case any balls were jarred loose, but it wasn't necessary. As the fourth photograph shows, I used Mobil 1 Synthetic grease. The gap at ~2:00 indicates it might be possible to cram 21 balls into the race but the correct number is 20. Operation now is so nearly friction-free that the bike risks going into a tank slapper just sitting on the lift at 0 mph. Good to see you have some decent quality replacement stanchions and that the ball races have been refurbished using synthetic grease. Nice idea with the nappy arrangement, I'm forever loosing steering head ball bearings, clutch rollers etc. during rebuilds, so thats a useful tip. One thing I don't quite understand is how the longer length stanchions will work without increasing the front ride height and compromising the fork spring loading? No doubt you've got this all under control but some further details would be interesting. One thing I don't quite understand is how the longer length stanchions will work without increasing the front ride height and compromising the fork spring loading? The spring loading easily could be taken care of with a pair of 3/4" spacers to return the preload on the springs to their original value, but that still would leave the extra 3/4" length. But, it's not quite so simple, as the attached photograph indicates. On the left and right are the stanchion from my Special Competition and from MAP, respectively, and in the middle is another stanchion from my horde. I didn't check all of them because the first two I grabbed (with different rust so from different bikes) are the same length as the MAP. So, why is my stanchion shorter? The answer is, because I didn't read BSA Parts Service Bulletin No. 9 carefully enough. Upon careful reading and cross-checking it turns out BSA calls these "fork shafts," not stanchions, and Bulletin No. 9 says the Special Competition takes 89-5061 which is the "shaft" for the scrambler. So, I learned from this that scrambler stanchions/shafts are 3/4" shorter than those for Clubmans. However, the Special Competition takes the same springs as the Clubman so with these stanchions/shafts I've simply converted the front end to Clubman specs. This means all is fine with both the ride height and spring loading. Clubman forks aren't even inappropriate since the bike came to me with a roadracing Lyta tank and rearset footpegs. If I had it to do over again I'd order the scrambler stanchions,[*] just because, but these will do just fine. I've made a note of this so if I ever decided to return it to 100% original specifications I could easily do it with a simple change to the forks. [*] I'd order the scrambler stanchions if I could find them. Where dimensions are given for the ones advertised under part number 89-5061 it says they are 'approximately 22½"', which is the length of the Clubman stanchions. The scramblers are approximately 21¾" (21-13/16" to be more precise). p.s. 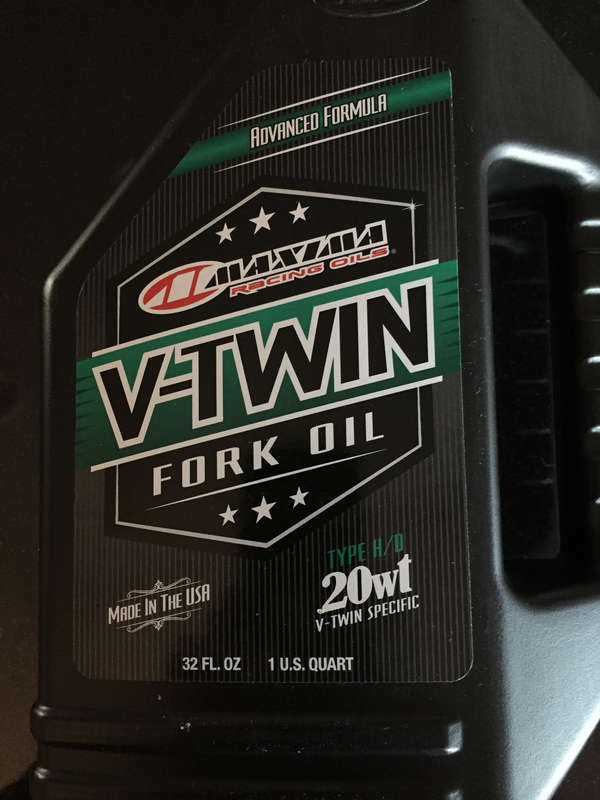 the bottle of 20W "V-twin specific" fork oil I ordered arrived today. I bought it because I'm sure it will work twice as good in my Gold Star V-single. Last edited by Magnetoman; 02/17/19 3:29 am. Reason: p.s. If you are going to the trouble of making a spacer then rather than just do 3/4" make one to give you a static sag of 1/6th of the fork movement with the usual rider seated. The rear static sag is 1/3rd of the shock movement if you have preload adjusters on the shocks, these with the right spring rates (we will just assume BSA got that right) will give a good balance between risks of bottoming and topping out. Assuming the spring rates are correct (which I still have yet to measure), the present parts give me stock Clubman forks. To do it right, as you suggest, would require me to assemble the forks, lower the lift to measure the sag, pump the lift back up again (~100 strokes of the footpedal), disassemble the forks, add an appropriate spacer or replace the springs, and repeat. It tired me out just typing the previous sentence so I'm going to assemble the forks and declare victory. It's interesting that searching further still hasn't turned up a supplier who has actual scrambler stanchions. Apparently whatever shop that makes these items only produces the longer Clubman version that then gets incorrectly labeled and sold by the various suppliers. I'm going to set aside the stanchions I removed with a note explaining to my future self that I need to unbend and refurbish them because proper replacements aren't available. Plan B would be to shorten a set of the Clubman replacements, which could be done by cutting a new taper at the top and re-tapping the threads. I could do that now if it were essential, but it isn't.